If you’ve noticed any dry, brown patches on your lawn, it’s easy to assume that it’s due to Sanford’s summer heat or dryness and that you just need to water your grass more. While this may be the case, it could also be due to a more serious problem—grubs. Why are Grubs a Challenge for Sanford Lawns? 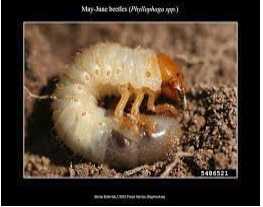 Grubs live below the surface of the soil and feed on grass roots. Heavy infestations will cause areas of your turf to die. This damage looks similar to dry stress, and many Sanford homeowners mistakenly assume the lawn only needs water to restore its appearance. Persistent grub feeding will cause permanent damage to your lawn, killing the turf, requiring you to renovate these areas. Timing is key when applying grub control in Sanford. The best time to treat grubs is preventative before they hatch, so you won’t be faced with severe lawn damage later in the year. 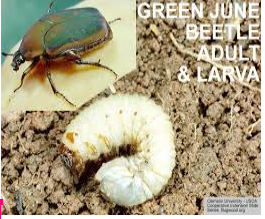 Get in touch with an Green Garden expert in order to control the grubs in your lawn. My “No-Hassle, No-Excuses, NO-NONSENSE, You’ll Love it OR We’ll Pay For it!” GUARANTEE. You must be absolutely delighted with our services!!! If for any reason, or no reason at all, you feel you’re not absolutely, positively, 100% happy with our work, I WON’T BE HAPPY EITHER. That means I WILL NOT REST until we make it right. I will immediately send my team to fix the problem no questions asked… If it’s still not good enough, we will pay a competitor of your choosing to fix it for you… That is how strongly I believe you will love what we do. Let us prove it to you!